Gayle M. Irwin is an experienced journalist and conservation and humane educator. She is the author of two children’s books. Several of her stories appear in Chicken Soup for the Soul anthologies. Gayle writes regularly for Our Town Casper, a monthly community magazine, and for The River Press, a newspaper in Fort Benton, Montana, and numerous other publications. She has created educational activity books and other written content for the Upper Missouri River Breaks National Interpretive Center in Montana. Gayle was raised in Iowa, where she first learned to appreciate nature and the outdoors. She sees God’s handiwork in all creation and believes great lessons can be learned by observing nature. She shares these lessons with students and others when she speaks. Gayle and her husband, Greg, reside in Casper, Wyoming. She is a member of Wyoming Writers, Inc. for which she creates newsletters and website content, as well as the Society of Children’s Book Writers and Illustrators. Learn more about Gayle, her works, and her pets at http://www.gaylemirwin.com. 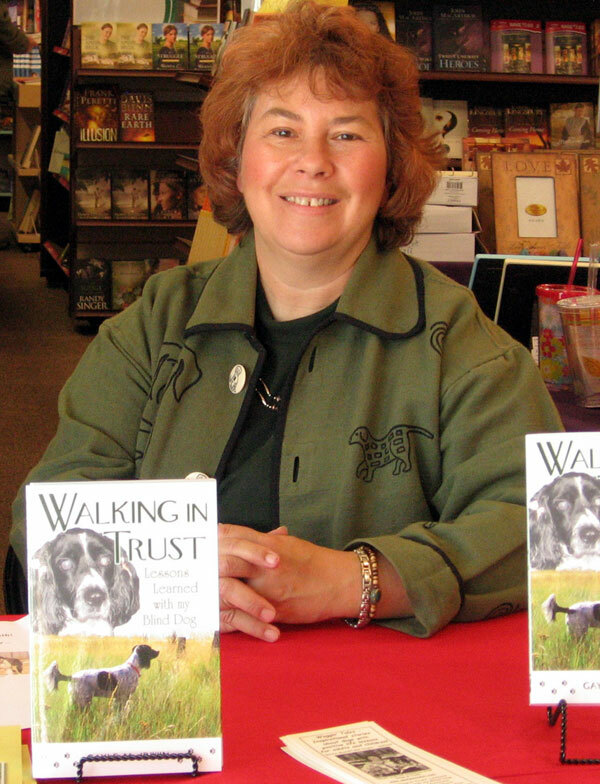 As well as numerous other books, Gayle is the author of the Cladach title, WALKING IN TRUST. 1. My husband and I were looking to adopt a Springer Spaniel because we liked the size and personality of the breed. 2. Two years after we adopted Sage, she became fully blind. This presented many challenges. The hardest part for me was trying to not feel sorry for her, wondering if she missed being able to see. But, as we shared life together, I came to understand that dogs are very resilient and that her other senses helped her navigate her surroundings, even those with which she was not familiar (i.e., school buildings, hotels, etc.) . 3. One thing that triggers my memory of Sage is when we spend time at our cabin. Not only is this the area where we lost her for two days, but it’s also a special place where we shared long walks in the forest, a cozy fire in the wood stove during spring and autumn, and evenings with friends and family. 4. If I won a reality TV show where my winnings would go to a charity, I would choose Best Friends Animal Society of Utah because they do so much to help homeless pets, not only those that come to their sanctuary, but numerous others around the country, through workshops, conferences, and other guidance. They also respond to pets in need during a natural disaster. 5. I feel like I’m really getting something done when I pray before my day begins and read a devotional, then focus on the goals I’ve set for the day and not let the phone or other potential interruptions distract me; that sometimes means closing my office door and letting the voice mail answer the phone. 6. Outside of my own home, the place where I spend the most time is the cabin and property on Casper Mountain. Our acreage has become my sanctuary, a place of solitude, a place to write, a place to spend time with God. Because it’s located only 20 minutes from our house, I’m able to go up there frequently, even if only for a few hours after work one evening. I am thankful for this lovely, quiet place! 7. My favorite sport to watch is basketball, but I sometimes sit through a baseball game with my husband, as that is his favorite sport. 8. If I had the time and money, I would donate to and volunteer more with children’s charities and companion animal groups, and also start my own pet foundation and animal sanctuary, particularly for disabled pets.